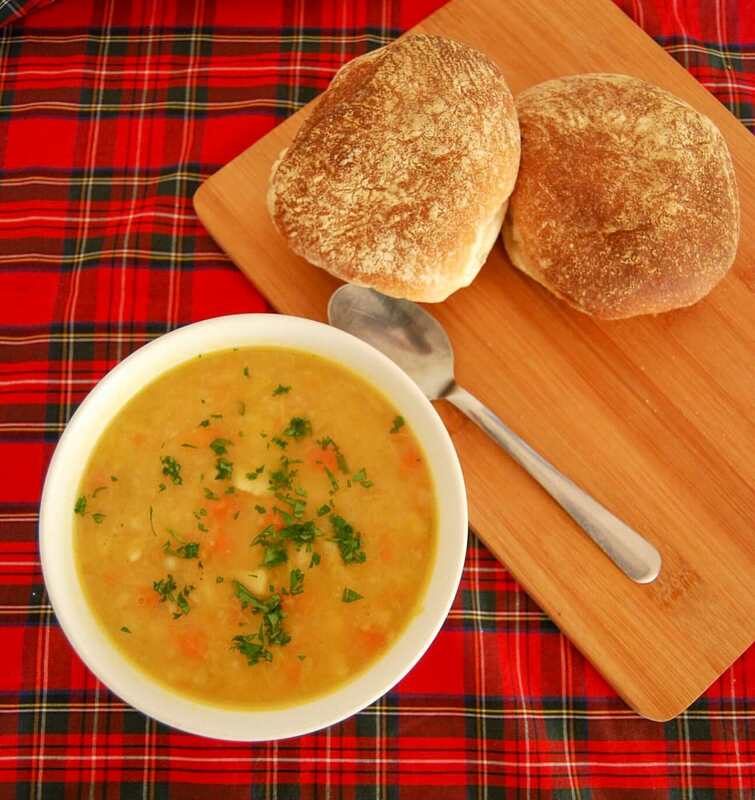 This tattie soup is very simple, nourishing, filling and cheap to make. 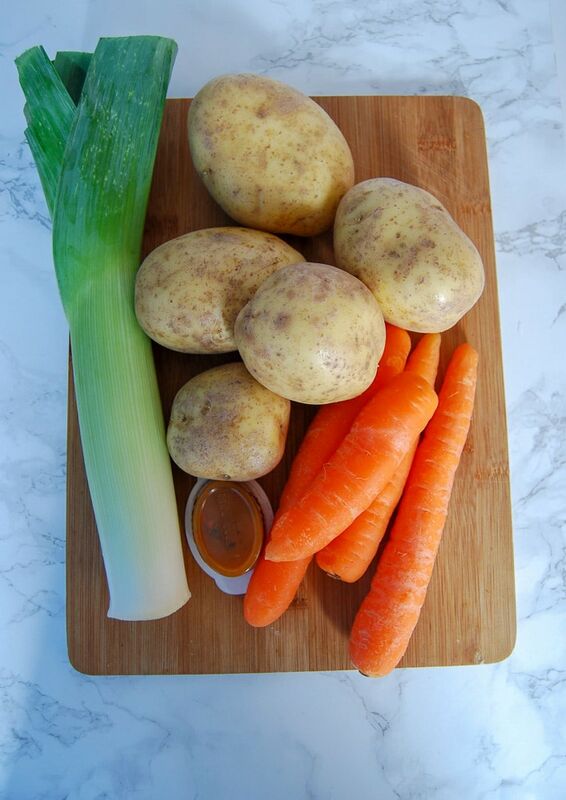 Every single person in the world who makes tattie soup will have a different recipe/method for making it. I actually grew up in a broth loving house and I don’t recall having tattie soup all that much when I was little. We definitely had that famous Scottish classic mince and tatties at least once a week! It was a staple in our house. What food do you remember from your childhood? 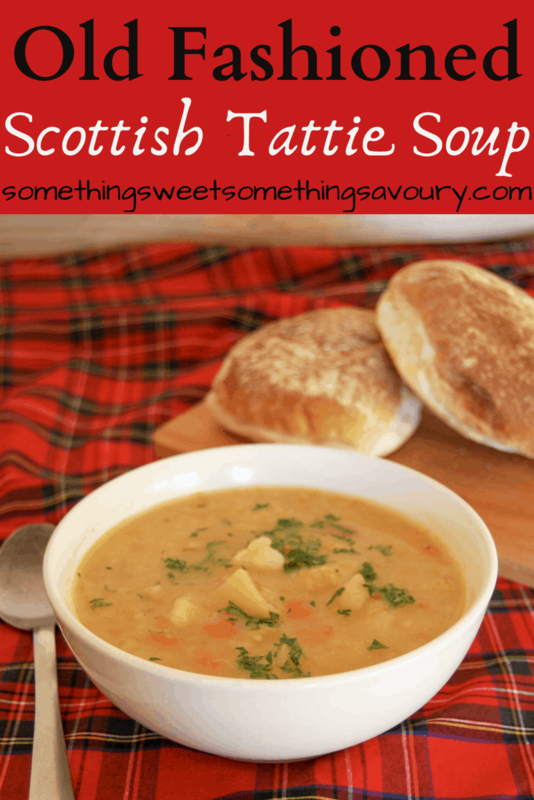 This tattie soup is very simple but nonetheless delicious and very comforting to eat. You need to mash some of the tatties into the soup to achieve the right texture. But don’t go overboard with the mashing – you definitely still want some large chunks. This is how my lovely mother in law made it. And now I make it for my husband and my boys. It’s like a hug in a bowl to them. 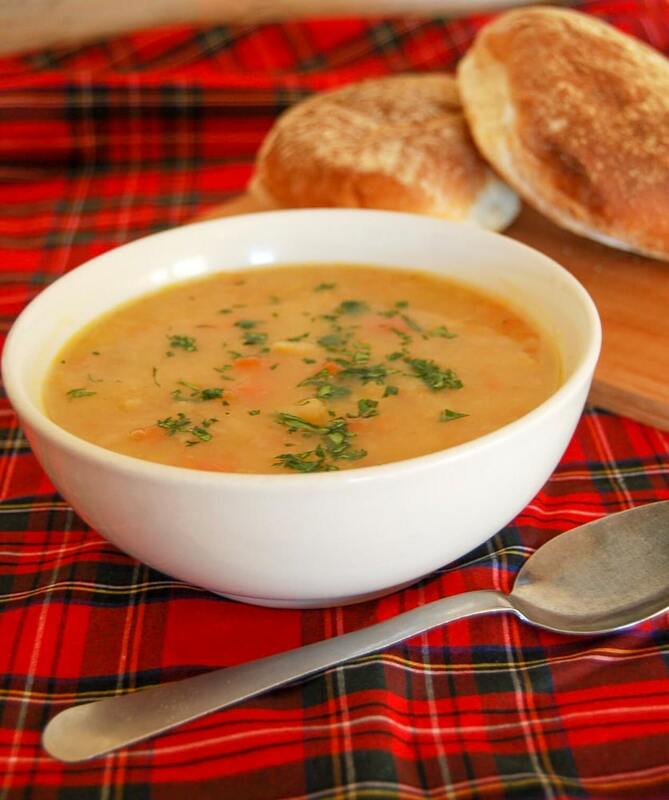 Whenever the weather starts to turn cold, I make a big pan of this tattie soup. It keeps us going for a few days. You know when you come home from work or from a walk in the Wintertime and you feel cold and weary? A hot, steaming bowl of soup is guaranteed make you feel better. If you’re looking for something to serve alongside this soup, my easy soft white sandwich loaf would be perfect. Or if you get your hands on them, Scottish white rolls or crumbly oatcakes would be even more appropriate! Potatoes – the floury kind. Waxy, new potatoes will not work in this recipe. Chicken or Vegetable stock – I know home made is best, but I just don’t have the time to make my own stock. I like those stock pots you can buy in all the supermarkets. If you don’t have/can’t get stock pots, a stock cube will also be fine! That’s all there is to it. Not only is it incredibly simple, it’s also very budget friendly too! A bowl of this nourishing, healthy soup on a cold Winters night will warm you from the inside out. If you make this recipe, let me know what you think! I love feedback – it really helps me to connect with you, the reader so I can bring you the recipes you want! That’s exactly why I’m here – I just love to develop and share recipes so any feedback is much appreciated! 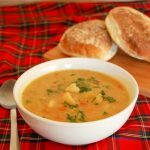 Looking for more classic Scottish recipes? 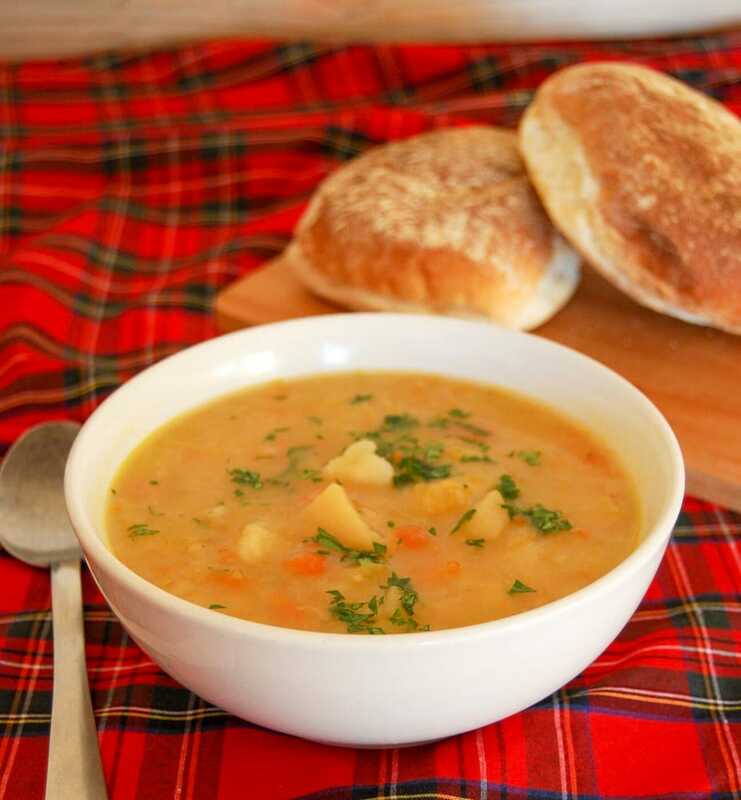 An old fashioned Scottish Tattie Soup. Simple, cheap to make and very nourishing! Tip in the vegetables, give them a stir and season with salt and pepper. Cook over a low heat for 10-15 minutes or until the veg starts to soften a little. Pour in the chicken or vegetable stock, cover and simmer gently for 1/1 1/2 hours or until the vegetables are soft and the potatoes are starting to break up. Using a potato masher, mash everything up, but not to much – you still want some large tattie lumps. If the soup is too thick for your liking just add some water to thin it down. Check the seasoning and serve with fresh bread or oatcakes. Softening the veg in the butter and oil at the beginning is not essential - you could simply just place all the ingredients in pot and leave them to simmer - but I find it adds a little extra flavour to the soup. Plus when did adding butter to anything ever hurt, right? My Granny never did it, so hopefully she'll forgive me for deviating from tradition! I can see why you crave this soup, it sounds so hearty and warming. I’m sure I’ll be making your Tattie Soup very soon. ? It’s a bit like a thinner version of Dutch ‘hutspot’, or boiled carrots, onions and potatoes mashed together. Lovely winter(y) flavours. Sounds and looks delicious. Thank you! My husbands aunt makes this and brings us it down for the freezer from Scotland when she visits but wouldn’t give me the recipe so I could get the ratio right. This however is perfect! Added a couple of oatcakes on the side and it tasted like my childhood in the Highlands! Ah ? happy belly soup. My mum would cook a ham in it as the stock. We’d have the cooked ham for dinner with mash and cabbage that night and then the soup the following – I admit to adding a handful of split red lentils and some parsnip to bulk it out. That sounds so good Lucy ? I often make a lentil soup with a ham hock or just a gammon joint, it’s perfect for when the weather turns colder. This reminds me of my Scottish Grandmother. I will be making soon but I’ll add some chopped celery. I’m sure would be a great addition – hope you enjoy!? I made this last night in my Instant Pot. I didn’t want to wait and hour and a half to try it. LOL. I added some garlic and shredded rotisserie chicken. It was fantastic! I will definitely be making it again. Thank you Kristina – I’m so glad you enjoyed! It’s such a great adaptable recipe.